Of the 28 Pennsylvania incumbents, 24 were re-elected. James A. Byrne Democratic 1952 Incumbent lost renomination. 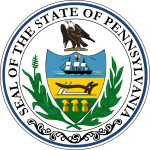 Pennsylvania 9 None (district created) New seat. J. Irving Whalley Republican 1960 Incumbent retired. Redistricted from the 27th district Republican 1972 (Special) Incumbent lost renomination.